The Stars forced running time with 10 minutes left in the game as Farmington's goalie faced a barrage of action. With no white flag nearby to wave, Farmington goaltender Victor Simones settled for turning his palms upward as if to say, "You've got to be kidding me." The gesture came Tuesday night with 53.7 seconds left in the second period, a point at which Holy Angels scored its fifth goal of the game on 43 shots. "Every little mistake we made they were capitalizing," Tigers coach Keith Revels said. "They converted on every opportunity." Not quite. But it was a sound effort. The end result was an 8-2 victory for the Stars at Richfield Ice Arena, and a whopping 59-21 final shots advantage. Connor Hurley and Zach Hartley each scored twice for the Stars, with Hurley, a freshman, adding three assists. "We knew if we worked around the net we'd get those shots," said Hurley, whose first helper came on brother Cullen Hurley's eventual game-winner. Though the teams were scoreless after the first period, Holy Angels held an 18-8 shots advantage that swelled to 43-14 after the second. The Stars eventually forced running time with a six-goal lead. That came with just under 10 minutes remaining in the game on a goal by C.J. Smith – the Stars' 53rd shot. From there Holy Angels skated its fourth line every other shift. "You just try and get better every game," assistant coach Guy Olson said. That hasn't been a problem for the Stars. Since starting the season 1-2, Holy Angels has won four in a row with 6-, 7-, 8- and 8-goal efforts. But defending Class 2A state champion Edina is scheduled for Friday, meaning there's no time for cockiness. "It's coming along," Olson said. "This game was a good experience for a lot of our guys." • ROCHESTER MAYO 11, MANKATO EAST 1: Spartans coach Lorne Grosso joined elite company Tuesday night. Grosso tied former Edina mentor Willard Ikola as the winningest boys’ hockey coach in state history with 616 career victories. He equaled the mark with the Spartans 11-1 victory over Mankato East. Grosso started his coaching career during the 1966-67 campaign. Ikola retired from Edina in 1991. • CHAMPLIN PARK 3, BLAINE 1: Senior forward Alex Ach scored the Rebels’ final two goals, giving Champlin Park a victory over the Bengals in the Northwest Suburban. Linemate John McDonald assisted on both goals. • BENILDE-ST. MARGARET’S 10, COOPER 1: Grant Besse had a natural hat trick in the second period, and Pat Steinhauser recorded his 100th career point as the Red Knights beat the Hawks. Benilde-St. Margaret’s scored five first-period goals. 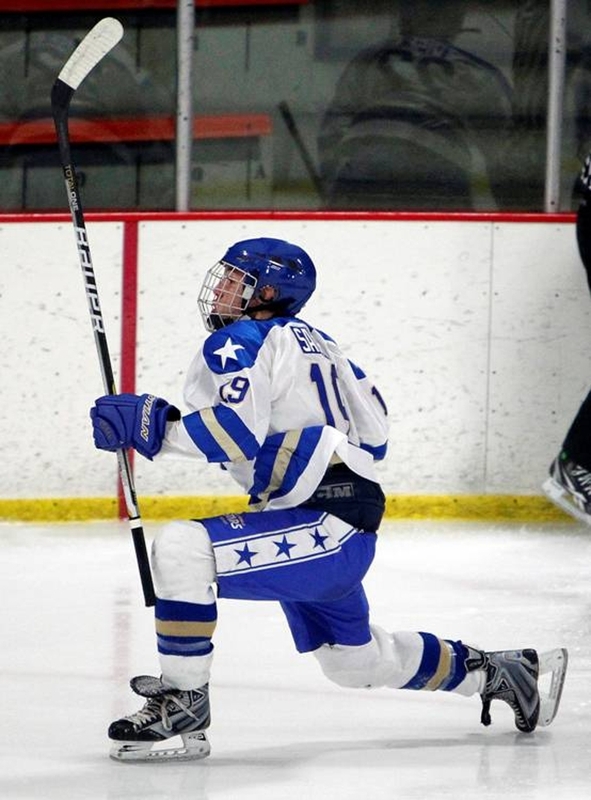 • LEGACY CHRISTIAN 3, MINNEAPOLIS 3 (OT): Brandon Lippold scored an unassisted goal with 1 minute, 10 seconds left, giving the Saints an overtime tie with the Novas. Minneapolis scored three consecutive goals, two on the power play, to take a 3-2 lead.